Free Spirit Publishing, 9781575424248, 22pp. Wiggly baby on the floor. What is baby reaching for? Celebrate the many ways that babies reach out to discover and learn about the world around them. 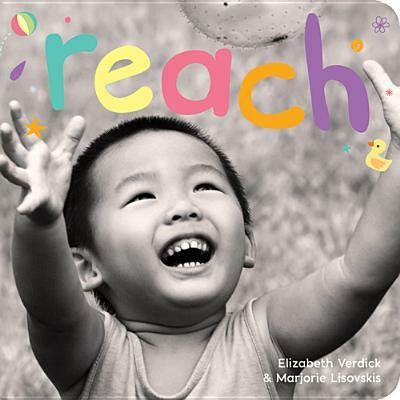 With lively rhyming text and vivid black-and-white photos of babies in action, this book is sure to engage babies and grown-ups alike. A great baby board book for floortime or anytime! What can baby do today? Reach . . . and move, play, eat, cuddle, and rest. The books in the Happy Healthy Baby series include appealing black-and-white photographs of babies and whimsical full-color illustrations that capture the moments and moods of baby’s day. Little ones will love the photos of baby faces, and the rhythm and rhyme will hold baby’s attention. Giggle, wiggle, head to toe. Tap and clap and rock and roll! Busy babies grow healthy and strong as they move about, discovering the many things they can do!